The first Snow Geese of the season arrived yesterday (November 29, 2016) at the Wattles Stewardship Center in Port Murray, Warren County, NJ. The ten radiantly white birds stood out, almost regal-like, among a flock of Canada Geese, as they grazed in the corn stubble of a recently harvested farm field along the Musconetcong River. 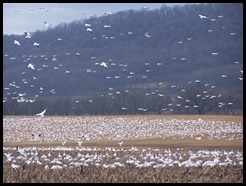 For several years now Snow Geese have been descending upon Warren County’s farm fields each winter, particularly around the areas of Merrill Creek Reservoir, the Musconetcong River valley, Lopatcong Creek, and the Alpha Grasslands, choosing to utilize the region as wintering grounds. Sometimes numbers of these geese are in the 10’s of thousands. But for the most part, many New Jerseyans are very familiar with only the Canada Goose since this bird can be found throughout the year in New Jersey in every possible landscape available – from backyards to urban parks and corporate lawns to coastal areas, farm fields, rivers, ponds and lakes. Canada Geese are everywhere, in fact there are so many, that in some areas of the state they have been implicated as the cause for impaired water quality, human health concerns, airline safety issues and severe crop and natural resource damage. Water quality however has become the biggest issue associated with high goose populations because of there droppings. A goose can produce up to ¾ of a pound of droppings per day and depending on sizes of local flocks and waterways, environmental impacts can be quite severe, especially if concentrated in an area. These stressors to water quality from large geese populations include increased nutrient levels and sedimentation and erosion (because of removal of vegetation at the edge of bank on water bodies due to grazing). Goose manure has also been linked to rising E. coli levels in the water, but the most notable ingredient in goose manure is phosphorous. Excess phosphorus can lead to algae blooms and low oxygen levels in water bodies. What is fascinating about our resident Canadian Geese is that about 40 years ago, Canada Geese were considered, more or less, only a spring and fall migrant in NJ. Although some Canadian Geese were purposely released in areas in NJ in the early and mid 1900’s, many wildlife experts believe that with the large expanses of lawn areas created by suburban sprawl and corporate development of the post-1970’s NJ landscape and changes in weather / temperature patterns over the years is what turned NJ into perfect goose habitat and created a situation where Canada Geese became a common winter resident and then transitioned to reside, nest and thrive here year long. Because of these changes to NJ’s landscape, many Canada Geese no longer need to undergo the risky process of migration when they can stay here year-round and have all of their life-cycle needs met with ease. According to the most recent available records (2014) the NJ Division of Fish and Wildlife has estimated that there are around 75,000 resident Canada Geese in NJ (this does not count migrants that may winter here or pass through). Now enter the Snow Goose, which is a medium-sized white goose with black wing tips and a pink bill, that nests in the Arctic tundra but is considered a common migrant in NJ and winters here. 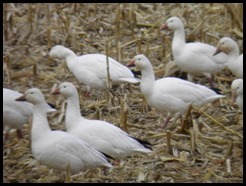 Snow geese although usually white in color can sometimes have dark plumage which is known as the “Blue Goose”. This color variant in a Snow Goose creates gray-blue body feathers and a white head (sometimes white belly feathers are also exhibited). This color phase is controlled by a single gene that makes dark colors partially dominant over white. In the past, Snow Geese wintered on the salt marshes and farm fields of southern NJ along the Atlantic coast and Delaware Bay shores. 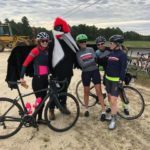 But over the last 20 years or so they have become increasingly common throughout the state in winter, including large flocks spending time on various inland reservoirs, freshwater lakes, agricultural fields and park or corporate lawn areas in Central and North Jersey. A strong flyer and swimmer, Snow Geese are also strong “long-distance” walkers. At home in the tundra, Snow Goose goslings have been known to walk up to 50 miles with their parents to look for more suitable rearing areas within the first three weeks of hatching! In the arctic it is mostly the Snow Goose goslings that have a plethora of predators to contend with, from raptors, gulls and jaegers to bears, wolves and arctic foxes. Here on their NJ wintering grounds its foxes, coyotes and eagles that are the main predatory concerns for the adults. However Snow Geese have a defense in which they call out to the rest of the flock when a predator is sighted, whereupon the entire flock takes flight causing a “whiteout” of sorts to confuse the predator from concentrating on attacking a single individual. Snow Geese are voracious eaters, with females being noted to forage up to eighteen hours a day. 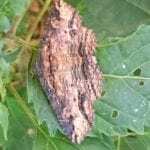 They are vegetarians that eat grasses, rushes, sedges, forbs, small shrubs and even small willows. 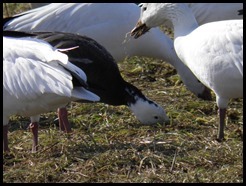 Studies show that a Snow Goose will eat almost any part of a plant including its seeds, stems, leaves, tubers and roots. 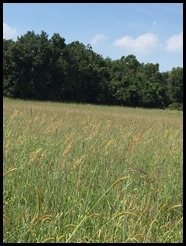 They do this either by grazing the tops of new growth, shearing off plants flush to the ground or ripping the entire plant from the ground. 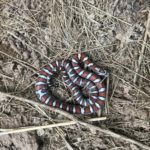 They are also known to eat grains, berries and young stems of farm crops (such as winter wheat) in winter and during migration. As one would expect, with this high fiber diet of plant material, food passes through a Snow Goose’s system in only about an hour or two. According to research this equates to a Snow Goose generating six to fifteen droppings per hour. The same study indicates that its defecation rate increases when a Snow Goose is searching for roots with its bill because it inevitably swallows mud. Because of their insatiable appetite in many areas of the arctic, the increased numbers of snow geese now surpass the ability of the arctic grass/sedge habitat there to support them. As the more productive forage areas are overgrazed and ruined, snow geese move on to find new areas that most likely are less productive and more prone to being destroyed. This habitat destruction impacts not only the Snow Goose, but other bird and wildlife species that depend on that type of vegetation for breeding, foraging and nesting. Also by overgrazing and removing the ground cover from the arctic soils, the soil is then more exposed and prone to evaporation. Thus with less moisture in the arctic soils, salinization (salt build-up) takes place in the soil. With increased salt build up in the arctic soils, scientists have documented numerous native arctic plants not growing back to these areas destroyed by Snow Geese overgrazing. When you consider that Snow Goose numbers have grown quickly since the mid-twentieth century on their nesting grounds (in some cases by a factor of 25), and that they now have caused serious vegetation destruction to their historical nesting grounds (over grazing and denuded soils) causing them to expand their range in search of new suitable breeding/foraging areas and that they learned to exploit human-created food sources along their migration and wintering areas, is it possible that like its cousin, the Canada Goose, it too will ultimately take up permanent residence in the Garden State? Only time will tell.